Do you ever wish your rug would just stay in place? You’ve put so much effort into arranging it just right, you owe it to yourself to have it stay that way. But between the kids and the random hustle and bustle of the house, somehow your rug never stays the way you want it to. In my house, not only does the rug get shifted… but the corners roll up to expose the rug pad. Luckily, VELCRO® Brand has a product that’ll solve your problem and keep your rugs in check every time. A true quick fix that’s, super easy! 1. Pick up a pack of VELCRO® Brand Sticky Back Fasteners. 2. Place your rug and pad in its desired place, making sure it fits neatly under the rug. 3. 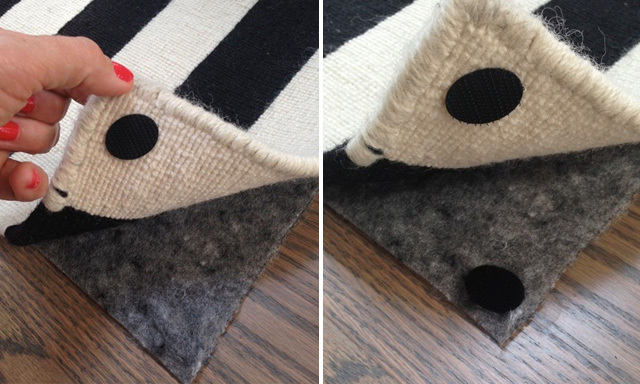 Starting at one corner of the rug, peel back and attach one side of the fastener to the underside of the rug. 3. Attach the opposite side of the Sticky Back fastener to the top of the rug pad. 4. 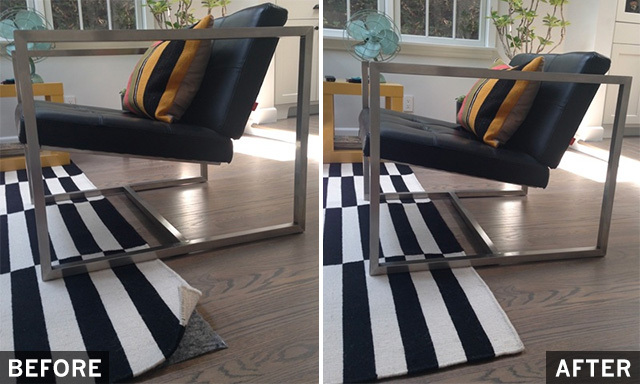 Repeat steps two and three…working your way around the rug, or just place the Sticky Back fastener on each corner. 5. Smooth it all out and you’re ready to go!